Size of smartphone, CardioMessenger® Smart is highly portable and convenient device. New Delhi, March 18 2016: World’s leading cardio and endovascular technology maker BIOTRONIK today introduced in India its latest and most advanced Home Monitoring Technology for patients with implanted cardiac devices such as pacemakers, implantable defibrillators (ICDs) and heart failure devices. BIOTRONIK Home Monitoring® is an internet based remote monitoring technology that enables physicians to continuously and reliably monitor their patients’ clinical and device status anytime, anywhere, and minimize risk of any negative medical event. The latest device in the BIOTRONIK Home Monitoring® program, the CardioMessenger® Smart is about the size of a smartphone and is highly robust, more convenient and remarkably portable as compared to previous versions of the device. Having the pacemaker wearers constantly connected to their physician, this home monitoring technology enhances safety for cardiac device patients. The device provides fully automatic transmission of vital information from a patient’s cardiac implant to their physician via BIOTRONIK Home Monitoring®. Data are transmitted from the patient’s implant to the CardioMessenger®’s transmitter device which uses T-Mobile and its partners’ networks (GPRS) to send data to the BIOTRONIK Service Centre from where the data is sent to the physician. “Home Monitoring has helped doctors world over to keep a very close look at their patients implanted devices and their cardiac activity. It has helped reduced mortality, episodes of hospitalizations and inappropriate shocks and helped improve the quality of life of patients immensely. It helps use of the full potential of the device that preserves battery life. It has also helped reduce routine clinic follow up, which can be a burden to patients and extra workload for physicians. These results formed basis for the Class I A indication, which means this is considered as standard of best care. This was the recommendation by the Heart Rhythm Society and is endorsed by the other professional societies around the world, including Asia Pacific Heart Rhythm Society.” said Dr Niraj Varma, Electrophysiologist at Cleveland Clinic, Ohio, USA who co-chaired this document. The CardioMessenger® Smart facilitates the application of Home Monitoring. “Another advantage of constant remote monitoring is that we as physicians get a closer look at trends in different patients. Some patients might have a more stable heart activity with a cardiac device; others may have more frequent discrepancies and episodes of arrhythmia. By regular monitoring data over a period of time, we can understand each patient and tailor our treatment and advice according to their needs and optimise device function. It also helps better our medical understanding and gives vital data for research. Regular monitoring of patients wearing pacemakers and other devices has traditionally been a cumbersome task since patients are required to visit clinics at regular intervals. In a country like India, where a patient from Bihar might have had a device implanted in Delhi, follow up visits can be very difficult. Sometimes, a medical event in between the visits could go unnoticed and be life threatening to the patient. Home Monitoring has made it easy, enhanced safety and also reduced cost” said Dr. Viveka Kumar, Senior Consultant Interventional Cardiologist & Director of the Cath Lab at Max Hospital, New Delhi. BIOTRONIK Home Monitoring® is the only remote monitoring system worldwide with US FDA and European CE approval to replace conventional in-office follow ups and provide early detection of clinically relevant cardiac events. It is the only system with fully automated data transmission. No patient interaction is needed, leading to the highest possible patient compliance. Physicians can define the events they wish to be notified with via email, sms or fax and view the events in order of importance. Regular data recording allows significant trend analysis, help physicians understand each patient’s condition and adjust their treatments accordingly. The process also allows better scheduling of follow-up appointments which may be skipped if not needed. “Digital technology has drastically changed the way we live, and its impact on healthcare is also profoundly visible today. The Indian government special emphasis on Digital India shows how IT and digitization is inextricably linked to development. Digitization is bringing revolutionary changes to healthcare delivery across the world, including use of telemedicine to reach out to patients in remote areas and make diagnosis results quicker. At BIOTRONIK, we believe that digital technology can be effectively used to benefit a large number of patients. BIOTRONIK Home Monitoring® systems are leveraging this technology not only to improve healthcare delivery but also radically improve the quality of life of our patients. 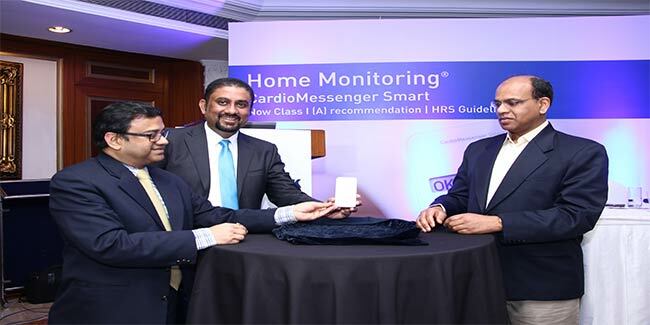 CardioMessenger® is the latest manifestation of how digital technology can benefit heart patients and help them live longer, more productive lives,” said Mr. Tushar Basu, Managing Director, BIOTRONIK India. Clinical studies have shown Home Monitoring makes patients feel more secure, improving their quality of life. 92% of patients surveyed said it gave them a sense of security, while 98% believed it had a positive impact on their health. Since its development of the first German pacemaker in 1963, BIOTRONIK has engineered many innovations, including BIOTRONIK Home Monitoring; the world’s first 4 F-compatible 200 mm peripheral stent; Orsiro, the industry’s first hybrid drug-eluting stent; and the world’s first implantable cardioverter defibrillators and heart failure therapy devices with ProMRI® technology.